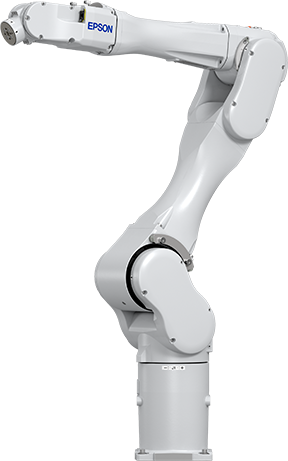 Our most compact six-axis robot, provides maximum efficiency with the smallest footprint. It's also extremely manoeuvrable thanks to an inwardly-orientated second axis. Epson's SCARA-Light robots are making great inroads into areas which were previously only served by very linear systems or other less flexible robots. Whether through introductory seminars, programming and maintenance courses or operator training sessions, our experts are happy to pass on their knowledge to you and your staff. Automation is the key for maximum productivity and precision in an increasing number of industries and applications. In particular, solutions that work effectively for smaller numbers of robots are becoming very important. You can trust a partner that knows robots inside and out, and can help you make your production process substantially more efficient. Epson is a pioneer in robotics and a full-service provider from manufacturing to sales and support. Since the launch of our first robot in 1980, we've been among the leading providers in the field of automation. We view ourselves as an automation provider with a flexibly upgradable product range that can integrate various optional components. We not only supply the largest range of SCARA robots for the most varied applications, but also six-axis robots, controllers and software. All our products integrate seamlessly and are easy to operate. Our robot systems are defined by their exceptional precision, speed, reliability and durability. A host of household names are very satisfied with the performance of their Epson robots. Modern automation solutions must meet a few simple requirements - they need to be as fast as possible, as small as possible and as inexpensive as possible. 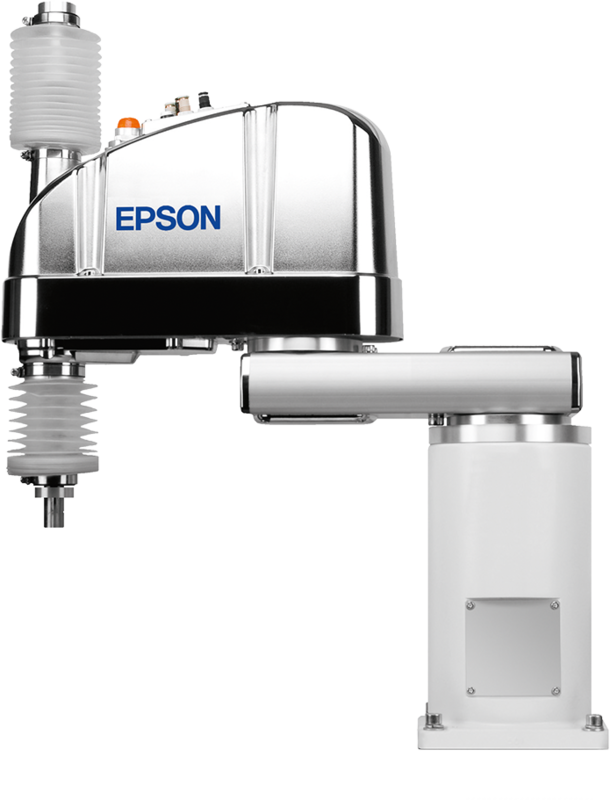 Epson can offer you a wide range of high-speed and high-precision industrial robots. 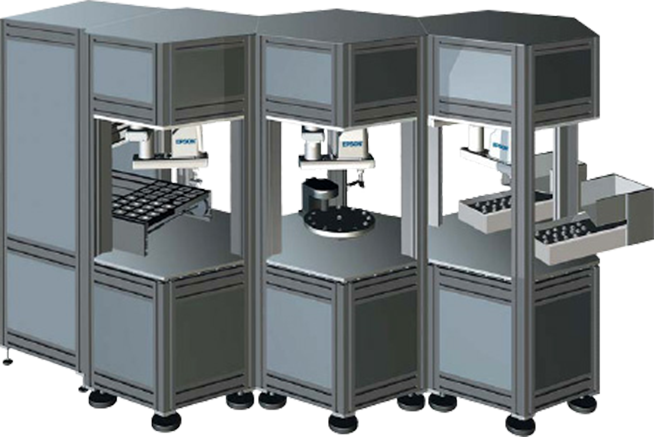 Next-generation SCARA robots - compact, high-speed, high-precision with options to suit your exact requirements. Epson robots give you more choice than ever before, so you need look no further for your next system. 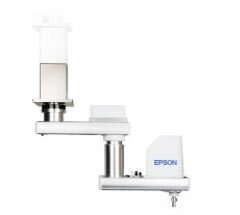 With a range that offers 300 different models in sizes from 175 – 1,000mm in reach, and payloads of up to 20kg, plus washdown and cleanroom models, chances are that Epson has the exact model and configuration you need for your application. Reduced mass but increased power. Optimised efficiency. Compact design but a larger work envelope. We always consider the next evolution. A slim design and minimised weight lead to considerable savings in operating costs. Compared to previous models, we've reduced our G-Series by 10 percent in height for the latest models. Since our robots have no tubes and the wiring is inside, this design is especially compact. We have increased the working range of our SCARA kinematics by an average 23 percent. The result is a work envelope that's equal to the envelope of competing robots of the next size up. We've achieved an average increase in axis speed of 20 percent and a similar increase in payload. Every kinematic has the highest positional accuracy in its class. All Epson robots stand out for their low power consumption. Electric energy is converted into kinetic energy to achieve the highest efficiency and shortest cycle times. Unequalled repeatability. Improved joining properties. Higher insertion forces and speeds. A space-saving design with reduced interference contours and that's just scratching the surface (which is something our robots won't do, of course). Epson's Spider robot has a great deal to offer. It is the first and only SCARA robot with a perfectly cylindrical envelope. Thanks to that, the impressively productive Spider can reach all positions within its area of activity (100 percent) and also makes a compelling case with its short cycle times. Efficient, economical, flexible and scalable, Spider robots cover all production bases. Thanks to the Spider's unique motion dynamics, with short travel distances and low deadload, systems can be designed and operated in a resource-efficient manner. Created especially for a free and open system design, the cell is structured from independently-functioning units. All units have common mechanical and electrical interfaces, which means easy swapping, easy assembly, fast transfer and precise positioning. No costly downtime for production lines, fast conversion of lines for new products, direct docking to existing work cells – this is the new flexible cell concept offered by the Epson Spider robot. We learn continuously from our development process and more than 30 years of building and operating industrial robots, as well as from our customers’ specific requirements. We learn more every day - What's left for us to optimise? How can we improve the economic viability of your production cell? Can we speed up the process without loss of reliability? These questions and others are the basis for exciting new developments. However, the best solutions are often the simplest, such as the Spider, with a design as clean as it is versatile. A basic requirement for the elimination of dead space, common among classic SCARA robots is overhead mounting. This approach means the robot mounting base is no longer an obstacle. 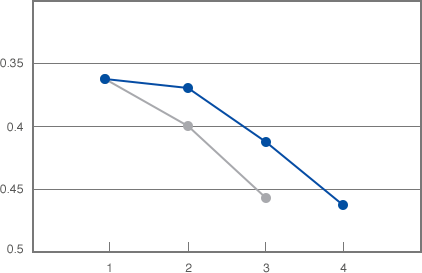 Both horizontal basic axes have the same arm length to reach the zero point of the tool axis. 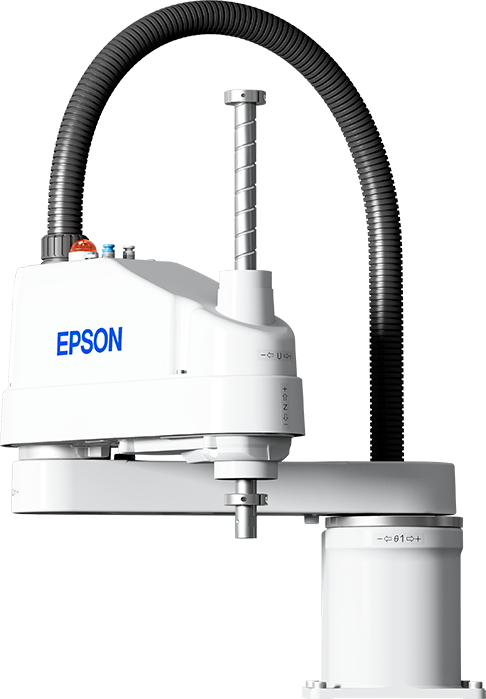 Instead of the usually kidney-shaped workspace found among SCARA robots, the workspace of the Epson Spider robot is perfectly cylindrical. This makes it possible to increase the workspace of both horizontal basic axes to 450 degrees. The resulting overlapping workspaces make it possible to approach a single position with up to four different arm orientations. This makes it possible to pass the zero point so that small movements can be carried out in a narrow space. Like all Epson kinematics, the Spider robot is equipped with the latest servo technology. In combination with the dedicated Spider design, cycle times can be achieved which were inconceivable until recently. ProSix six-axis robots make a compelling case through high-speed, precise travel. Standard cycle times of up to 0.37 seconds at repeatabilities of +/–0.02 mm ensure a high throughput and increase economic viability. Environmentally friendly production generates sustainable quality, increasing the efficiency level of our robot systems. We save resources, you reduce your overheads. A lean design plus reduced weight and power consumption result in savings in ongoing operating costs, thanks to offering more performance in less space. By reducing the deadload of the S5 six-axis robot by 13kg, the level of efficiency between supplied energy and payload has been optimised, resulting in real operating cost savings for you. RC180 and RC620 controllers are extremely compact, have few components and are notable for their minimal power dissipation. This has made it possible to lower the total power consumption of the control system by almost a quarter. 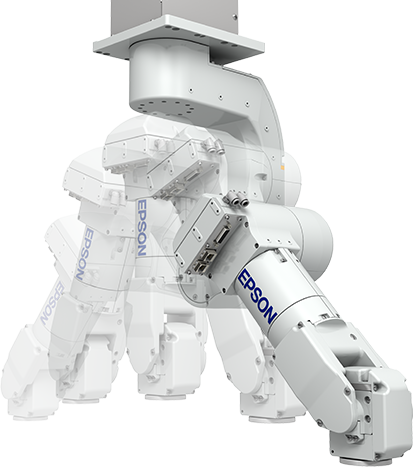 By reducing the deadload of the Epson six-axis robot S5 by 13 kg, the level of efficiency between supplied energy and payload has been be optimised, once again resulting in reduced running costs. All of Epson's ProSix six-axis robots are characterised by especially low power consumption. They'll also save you money thanks to maximum reliability and reusability of components. Think industrial robots are only worth buying in large batches? Think the numbers don't add up for smaller companies? Wrong, in both cases. Epson's SCARA-Light robots are making great steps into areas which were previously only served by very linear systems or other less flexible robots. SCARA-Light robots are extremely flexible. They are especially easy to programme and to use and they fit your precise requirements. At the same time, they're as fast and reliable as you know Epson robots to be. SCARA T series with controller built in. Automation solutions are becoming ever more intelligent, efficient and cheaper. There’s no better example of this than the T-Series SCARA robot. It is the introductory model in our comprehensive SCARA product range — ideal for simple pick-and-place applications and in areas where linear systems were previously used. 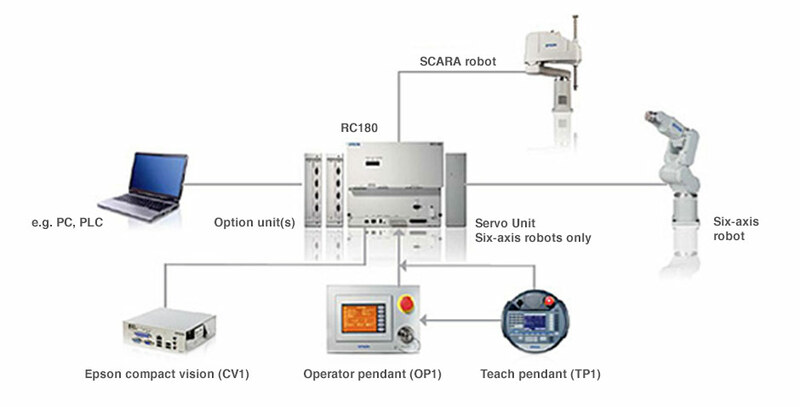 For a very affordable price, you get a powerful four-axis robot with integrated controller and diverse connection possibilities, such as to Profibus and Profinet. The T series also supports image processing, integration of external software and the option to design a custom user interface. 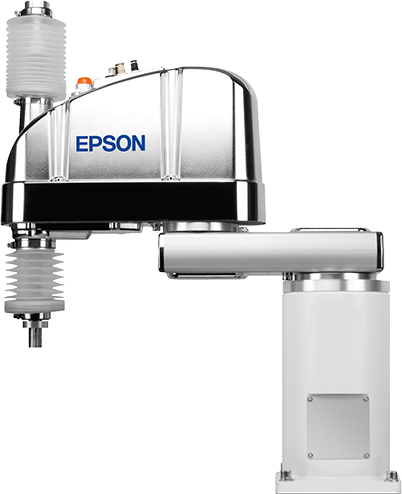 Epson robots reach their end position much faster and more accurately while producing the smallest possible amount of vibration. Optimal positioning, short cycle times and higher path accuracy mean that with Smart Motion, economy of movement is guaranteed. Because of overshooting, traditional motor controllers lead to increased deviation. This results in inaccurate positioning, poor interpolation and longer processing times. With Smart Motion on the other hand, there is minimal overshooting. 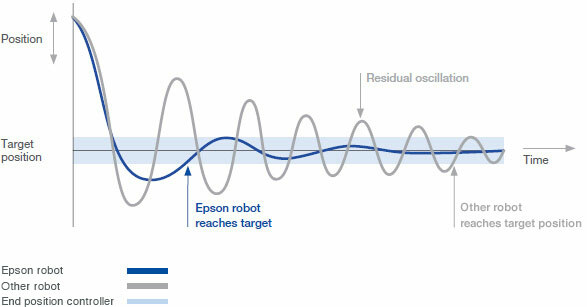 Even in the case of extreme cycle times, Epson robots are precise, gentle on products and quick to get to the point. 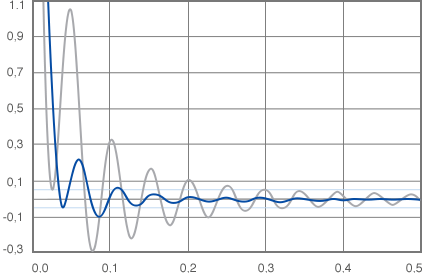 Vibration control thanks to Epson's QMEMS sensor technology1. Our robots use revolutionary QMEMS sensor technology, which drastically reduces the vibrations of the kinematics. This makes it possible to increase production speeds while keeping a consistent quality level during assembly tasks. Even where start speeds are high or deceleration is heavy, strength lies in smoothness for performance levels that seemed unachievable until now. QMEMS is a combination of quartz, a crystal with excellent characteristics such as high stability and high precision, and MEMS (a microfabrication technology). We apply precision microprocessing based on quartz material to a semiconductor MEMS material, to create a quartz device that we call QMEMS which offers high performance in a compact package. Controllers enable the fast, accurate, and very reliable control of manipulators and peripheral devices. They provide high performance in extremely confined spaces. The basic unit is a robust integrated system which is open in all directions. With a base area only slightly larger than an A4 sheet, the RC180 is incredibly small and yet very powerful. Smart and great value too, it has been designed primarily for slave network operation. It is very flexible, and able to be used for SCARA as well as six-axis robots. Compact, powerful and as flexible as you need to meet your demands, the new RC700-A controller is a universal prodigy, just as capable as a stand-alone or part of an integrated system. If it's extended to create a multi-manipulator controller, the RC700-A can control several robots and various peripherals in a complex system. 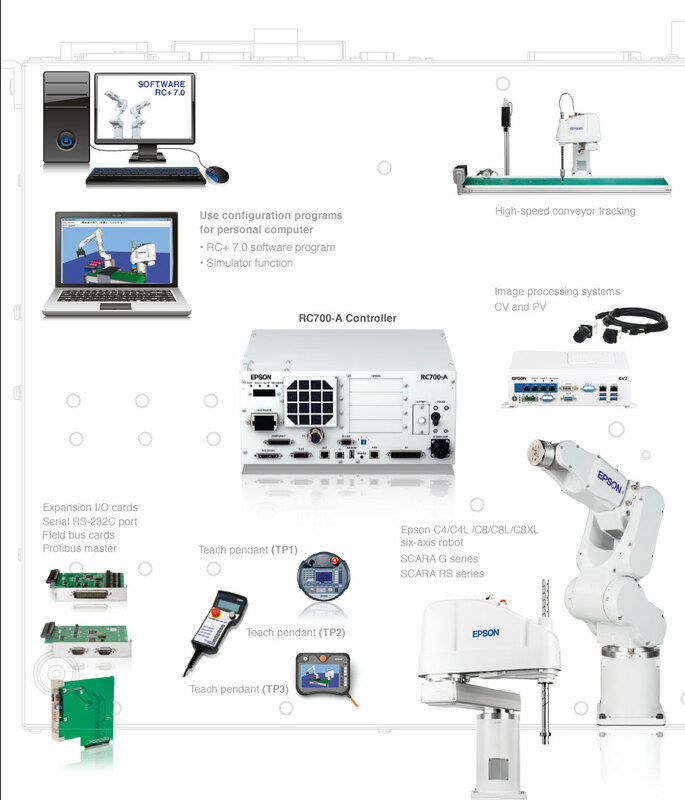 The RC700-A controller can be expanded with a variety of image processing systems to meet your requirements. It's also designed for the new generation of robots featuring Epson's QMEMS sensor technology. The RC700-A can communicate with all conventional field bus systems and is open for the connection of lower and higher level controllers, sensors, actors, conveyor belts and other peripherals. This means that the RC700-A can take over all robot control, motion control and process control functions, without the need for a PLC. If several robots and peripherals are connected to the controller, the RC700-A’s multi-tasking ability enables you to use your system more effectively and with less susceptibility to problems. Synchronisation takes place using markers and without additional wiring being required. The RC700-A can process 48 multi-tasks. Of these, 16 tasks can be run as background tasks - even if the robot program is interrupted. This multi-tasking ability means that even complex processes can be controlled easily within the work cell. Using the integrated Ethernet port the RC700-A can be connected to other Epson robot systems or company networks at no extra cost, enabling you to access the controller from your desk. The RC700-A's compact dimensions enable it to be fitted in a control cabinet. It can be installed in various positions - horizontal or vertical, on the floor, on the ceiling or on the wall. All the ports are located on one side to make it easier for you to connect the controller quickly whilst also ensuring easy access for maintenance and repair work. The number of assemblies has been minimised, which increases reliability. All components can be replaced without the need for special tools. The trigger key enables you to save a complete backup including system status to a USB stick at any time whilst the system is running. This allows simple offline error analysis. The RC90 is one of the the most compact and lightweight controllers of its performance class on the market. Small, smart and very good value, it was primarily designed for slave network operation. Serial interface RS-232C, 26/14 standard I/O and an Ethernet port are already installed. Also, expansion cards for communication with external devices and integration into fieldbus networks can flexibly expand your system according to your requirements, at a very low cost. Communication interfaces include Ethernet port, USB, USB backup, standard I/O and RS-232C incl. Epson RC+ development environments – powerful, efficient, intuitive. The powerful Epson RC + project management and development environment is ideal for straightforward programming of your application thanks to its intuitive Windows user interface, open structure and integrated image-processing. This is in addition to a 3D graphic environment that lets you simulate your robot program almost completely, and clearly visualise robot movement. The RC+ 5.0 development environment gives you all the tools you need for fast and efficient programming. Our project management and development environment runs under the latest versions of Windows and communicates with the RC180 controller via USB and Ethernet. Its open structure also includes an option for integration into external programming environments. Syntax colouring, debugger, input assistance and a freely definable interface help you with development tasks. It's always good when complex projects are simple to implement. With a full range of development tools, with RC+ 5.0 you have everything at hand to programme your applications efficiently. Includes all robot-relevant information and control elements, clearly organised in separate windows for configuration, point processing, fly-by point parameters, tool and robot coordinate systems, payloads and inertia. Via the robot control desk, motors can be switched on and off, and resets or even home runs can be executed. Editing of labels for I/O, flag/ fieldbus I/O for bit, byte and Word data bandwidth. Status display of I/O, flag/ fieldbus I/O for bit, byte and Word data bandwidth. It's also possible to create special user displays. The powerful RC+ 7.0 project management and development environment is ideal for the straightforward programming of your applications with, its intuitive Windows interface, open structure and integrated image processing. The software is capable of controlling all types of robots and functions. It also supports a graphic 3D environment which enables you to simulate the robot program almost completely, and visualise robot movement. It´s a great thing when complex projects also become simple. With the tools in the RC+ 7.0 development environment, you have everything you need to programme your applications efficiently. Includes all robot-relevant information and control elements, clearly organised in separate windows: configuration, point processing, fly-by point parameters, tool and robot coordinate systems, payloads and inertia. Via the robot control desk, motors can be switched on and off and resets or even home runs can be executed. Status display of I/O, flag/fieldbus I/O for bit, byte and Word data bandwidth. It's also possible to create special user displays. Plan and visualise all the procedures in your production, validate your program offline and carry out troubleshooting and editing work easily from your desk. The RC simulator which is included in the software package enables you to save time and money during every phase. During the design phase, you can plan your robot cell accurately and quickly, and easily and reliably estimate the cycle time for your application. 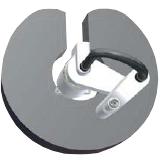 This allows you to prove feasibility before a single part of the installation is manufactured. You can also prepare for later expansions in the simulation to minimise shutdowns within the live installation. Prior to robot delivery, an offline program validation will be carried out. Programs can be created in parallel and even complex motion sequences can be visualised and evaluated. This helps to detect collision risks and avoid damage to the equipment. Troubleshooting and program modifications can be comfortably carried out from the desktop Collision detection, reachability checks and robot motion can all be visualised in 3D. The line-based SPEL+ script language specially developed by Epson is not just powerful but also easy to learn. Its range of commands enables you to program a very wide range of robot motions – from a simple pick and place applications to complex multi-manipulator line control. SPEL+ is translated into robot code by a compiler. This is carried out faster than by using an interpreter, and the syntax can also be checked before the program is run. The extensive range of comments for various applications means short programming times with far fewer errors. You can also add your own commands using the SPEL+ syntax. In addition to program structure commands, you can use sub-program techniques, multi-tasking and interrupt commands to write programs which are easy to read, enhance and expand. Whether for easy handling of inputs and outputs, communication via the serial TCP/IP port, or exchange data in a field bus system – SPEL+ minimises programming work. SPEL+ has no cryptic codes and uses real values. SPEL+ syntax can be transferred to a variety of .Net products. It also has an interface to LabVIEW. Our powerful integrated image-processing systems detect and position parts reliably in spite of production deviations, part-exchanging or varying lighting conditions. Thanks to the joint programming environment within the Epson RC+ development interface, no time is wasted when connecting robot and vision system. Through simple commands and an intuitive interface with graphic objects, tasks that require flexible automation are solved with simple parameterisation. Communication in milliseconds between robot and image processing. Reduction of development time through integration into the RC+ development environment. Easy and comfortable drag and drop programming without additional complex editors. Detection of parts even in varying lighting conditions thanks to tools such as blob analysis, geometric and polar search, and many more. Epson Vision Guide 5.0 is not just the connection between Machine Vision and the RC180. It's closely integrated into the Epson RC+ development environment so that vision sequences can be created with just a few mouse clicks. Thanks to a common programming environment, no time is wasted connecting robot and vision system. Easy commands and an intuitive interface with graphic objects allow completing flexible automation tasks by means of simple parameterisation. This powerful image-processing system reliably detects and positions parts despite variations in production or changing parts, in combination with an Epson compact vision control unit and cameras. With the geometric object software tool, objects can be detected faster and more reliably than with a traditional pattern or edge detection system. Commands are easily selected from a clearly structured library that processes the position of the robot. Therefore the complicated, tedious and error-prone linking of several command sequences becomes superfluous. Create vision sequences with just a few mouse clicks. Vision Guide 7.0 supports high resolution cameras. This compact system is particularly suitable for users who do not always rely on a computer for image processing. For requirements such as short cycle times and an extremely high camera resolution (more than 1.3MP). This solution is suitable for users who require very short cycle times and extremely high camera resolution (more than 1.3MP) for their application. 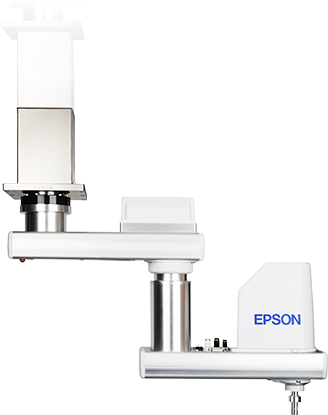 Thanks to our proprietary piezoelectric quartz sensing technology, Epson's force sensors are durable and sensitive, allowing them to accurately and consistently sense minimal amounts of force in six directions. This lets users automate complex manufacturing tasks and improve productivity. Sensors are supplied with robot operation commands, to make implementation quick and easy. 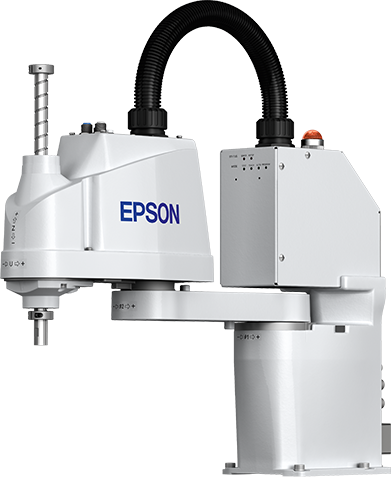 Epson’s innovative force sensors answer the need for automation of delicate or pressure-sensitive tasks, and are a significant step forward in improving the way products are manufactured by robots. 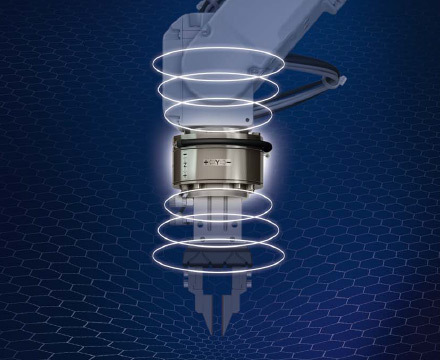 The S250 series enables robots to sense force as low as 0.1N, allowing the robots to automate complex tasks such as precisely assembling delicate components. The sensors can also be used on tasks that formerly relied on human sensory perception such as polishing and deburring, freeing employees from repetitive manual work. Our hardware and software components provide the enhanced functionality and configuration flexibility you need for full-process automation. Our standard automation products cover the majority of possible uses, but if you have unique requirements, that's no problem. 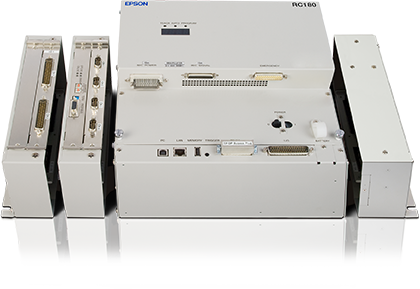 We have a range of additional hardware and software options for Epson manipulators and control systems. These components will allow you to implement a bespoke production design, efficiently and flexibly. Enables brake release so a robot arm can be moved by hand when the power is switched off. Securely mount a machine vision system camera to a robot arm. 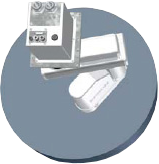 Allows power and signal cables to be routed through a hole in the mounting plate directly below the manipulator lead out, so that cables are not exposed in the robot cell (recommended for clean room applications, for example). Two-piece bellow set for mounting on the z-axis. Protects the spindle or the nearby environment from grime and dirt. Allows the user to install wiring within the robot arm, for a cleaner exterior. The cables run under the cover of the second arm and directly into the hollow z-axis from there, eliminating any external cabling. Standard 3m cables or optional 5m and 10m cables for greater freedom in controller and robot placement. 20m cables can be supplied on demand. Enhanced handling and processing versatility, while simplifying effector changes. A wide variety of controller options can be employed to further expand the range of process tasks you can automate. Built-in image-processing engine assists vision-to-robot calibration, making it much easier to align the robot's coordinate system with the camera's field of view. Advanced pattern matching and geometric search tools enable easy program development solutions without writing a single line of code. 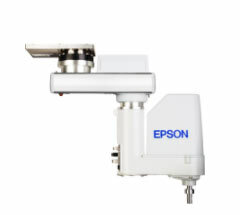 Epson sees image processing, conveyor tracking and robots as a logical functional unit, without interface problems, yet with maximum flexibility. Conveyor belt movement is constantly measured via an encoder. Even if the speed between the detection and handling of an object changes, the robot can grip or put it down accurately. We provide you with several belt tracking possibilities via camera or sensor tracking (a light barrier, for example). If the standard 24 inputs and 16 outputs are not enough, yet you do not wish to set up a fieldbus network, your system can be expanded by further 32 inputs and 32 outputs per card for RC180 and further 24 inputs and 16 outputs for RC700-A. Up to four expansion cards in total may be used. Is your unit already using a fieldbus system or would you like to reduce the amount of wiring for future connections? In this case, the following slave cards are available for the RC180: Profibus, DeviceNet, CC-Link, Ethernet/IP and EtherCAT. The panel is also designed for operation and visualisation tasks within complex systems. The control panel shows five function-specific monitors for comfortably switching back and forth. 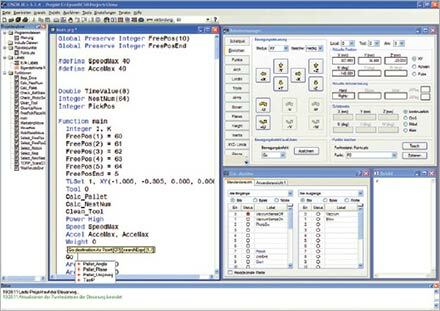 The freely editable user dialogues can be easily produced via the Epson programming language. The PG board mainly serves to monitor conveyor speed for conveyor or sensor tracking via an encoder. Combined with additional software, it can also be used to control non-Epson kinematics. Stepper as well as servo motors are supported. A few devices still offer a serial interface as the only communication method. You can use up to four of those interfaces via the serial expansion card. The portable control and display unit fulfils all observation, operation and parameterisation tasks for SCARA and six-axis robots. The Teach Pendant can execute different commands, including motor on/off. The control is designed ergonomically both for right-handers and left-handers, and offers fatigue-proof handling. The portable control and display unit fulfills all observation, operation and parameterization tasks for SCARA and 6-axis robots. The Teach Pendant can execute different commands, including Motor On/Off. The control is designed ergonomically both for right-handers and left-handers and enables fatigue-proof handling. The mobile terminal features an ergonomic housing with a brilliant and high-contrast 10“ TFT-LCD display. 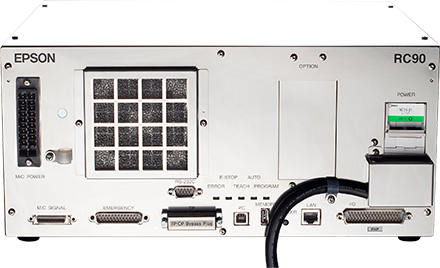 Thanks to fast processors, it is perfectly suited for demanding visualization and operating applications. The control is designed ergonomically both for right-handers and left-handers and enables fatigue-proof handling. Epson's long experience in factory automation enables us to offer a wide array of easy-to-use software programs to help you achieve maximum productivity with minimum programming overhead. 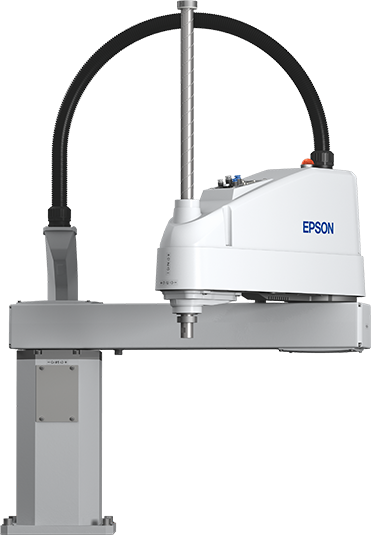 We at Epson view image processing, conveyor tracking and robots as a logical functional unit, without interface problems, yet with maximum flexibility. The conveyor belt movement is constantly measured via an encoder. Even if the speed between the detection and handling of an object changes, the robot can grip and/or put it down accurately. We provide you with several belt tracking possibilities: via camera or sensor tracking (e.g. of a light barrier). For processes requiring the work piece to be moved against a fixed tool, external control points can be used to ensure precise positioning. Up to 15 external control points can be set. Force/torque values can be set for just one axis, or all six. Trigger values can be set to stop robot motion when a specific force level is reached. Quickly and easily create control program custom interfaces that can take the place of dedicated PLCs and display devices. Full-featured toolset is easy to understand and use. Enables simple GUI creation without using Visual Studio or other third-party software tools. Makes it easy to build a graphical user interface, even if you've never built one before. With OCR (Optical Character Recognition) written text and icons are reliably recognised and the inscription is controlled. even under adverse conditions of use such as changing backgrounds or high clock rates. The PG board mainly serves to read conveyor speed for Conveyor or Sensor Tracking via an encoder. In combination with corresponding further software options it can also be used to control kinematics not consisting of Epson components. Stepper as well as servo motors are supported. Password-based protection levels can be set to restrict access to some parts of the EPSON RC+ system. Helps prevent accidental or unauthorized alteration of control programs when multiple operators need to have access to basic controls. Robots can be controlled using Visual Basic®, Visual C®, LabVIEW™, and other third-party programming languages. Robot status and variable values can be captured. Third-party Visual Basic interface and database design tools can also be used for program development. Manual actions during component placement and assembly can be both inefficient and error-prone. It's also a fact that the movements of the human arm are restricted by nature. Thanks to the optimal relationship between axis 1 and axis 2, Epson robots enjoy maximum mobility and can assemble the smallest components accurately every time. With their excellent dynamics, high insertion forces and rigidity values, and an excellent deadload/payload ratio, our robots are ideally suited for component placement and assembly tasks. At the same time, they are sturdy, durable and work very reliably in all conditions. Quality controls, trial runs before serial production and data measurements are all areas where precise recording is vital. With Epson robots and a powerful integrated image processing system, these tasks can also be mastered with high clock rates. The PC-based RC620 master controller can be expanded with additional measurement and testing hardware, and is easily integrated into image recognition systems or force-moment sensors supplied by other manufacturers. If a product deviates from the tolerance values set via the predefined parameters, it is rejected as faulty. Modern packaging requires high levels of flexibility in packaging lines. The main goal is to ensure shorter product exchange times while maintaining high standards of process safety. Epson robots have everything under control. They pack and palletise even highly fragile components. With conveyor tracking, components can also be grabbed and deposited on running conveyor belts by the robot. 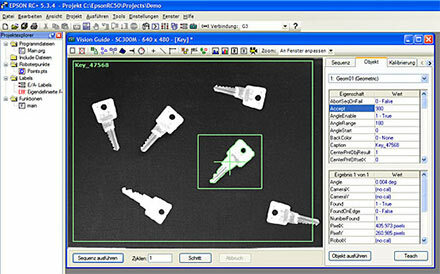 In the process, objects are detected by a camera or a sensor. Loading and unloading of conveyor belts, pallet systems, plastic injection moulding machines or metal casting machines are only a few examples of tasks in this area, which the Epson robots can perform accurately and reliably. Work cells can be transformed into production islands, for example the fully automated process of injection moulding machines, with removal, cooling and deburring in one single operating sequence. Handling of work pieces or tools, cutting, grinding, deburring, polishing, welding and soldering, transforming, coating and a range of automation solutions. You can download manuals, drivers, CAD data and other materials relevant to Epson automation, discover what training is available in your area, or find out more about servicing and maintenance of Epson automation solutions. How do you efficiently integrate an automated system into an existing operation? How do you optimise cycle times? How do you integrate robot programmes into external software? Our application engineers are there to assist you during the project management and implementation phase. We are happy to assist you. The fields marked with (*) are mandatory fields. 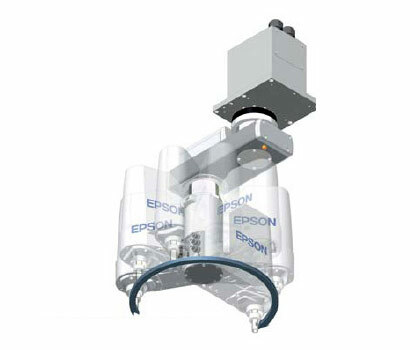 In many European countries, Epson works in cooperation with distributors for the sale and service of the robots.